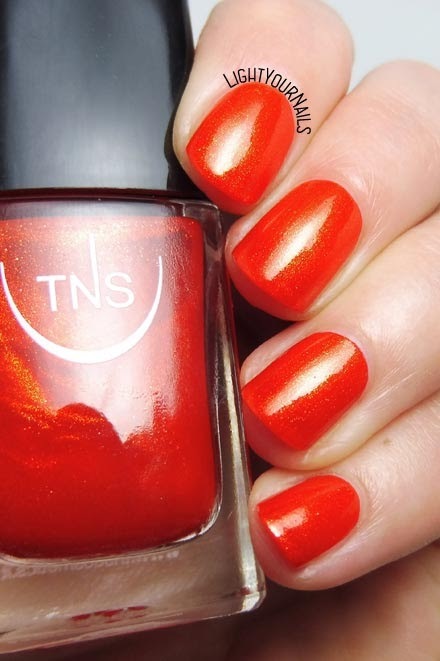 TNS Lungomare: Calipso | Light Your Nails! Today I'm showing you another shade from TNS Cosmetics Firenze's Lungomare collection for summer 2018. This is no. 541 Calipso. It's a bright orange with a very strong golden shimmer. It's completely different from the 2 other shimmery shades that I've already reviewed from this collection (Villa Imperiale and Baia d'Oro). Those two were quite sheer while this one is almost perfect at first coat already. Second coat only helps the shimmer glowing even more. That was a surprise. Application is easy and drying time is fast. It doesn't dry glossy though so you definitely want a top coat. As you might understand from the photos that's a shade for someone who wants to get noticed! It's dazzling! Would you dare wearing something this bright? Scusa il ritardo ma mi sono appena accorta che blogger non mi notifica i commenti... devo capire il perchè. Se ti viene in mente fammi un fischio! Anche questo non me l'ha notificato, ho dovuto guardare io nella bacheca. Che scocciatura!